Casio has unleashed its "tough-man", a rugged, take anywhere, compact model known modestly as the G1. 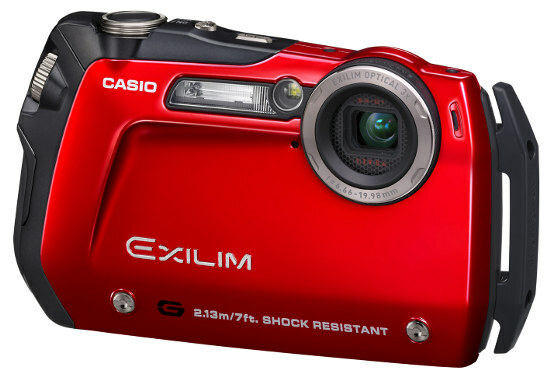 This tough looking camera is ready for any adventure and according to Casio it can take a licking and keep on clicking. Casio claims that the new G1 is waterproof, dust proof, freezeproof and shock resistant (at 7ft.). They are calling it their "Endurance" camera. Are they right? We shall see, we shall see. Not new to the Exilim are the BestShot modes, but there are two new members to the BestShot modes: Interval Snapshot and Interval Movie. They both work the same, when you use this feature the camera take an image every so often for a specified length of time. For example you can set it to take a picture every ten seconds for a 30 minute stretch of time that starts when the shutter button is pressed. Also, while not a new feature I was supprised to find that Dynamic Photo has found a home here. Dynamic Photo made its debut on the Casio EX-Z450 and allows you to superimpose part of one image onto another image directly in the camera. shock resistance from up to 7ft. Click here to read Casio's official press release.